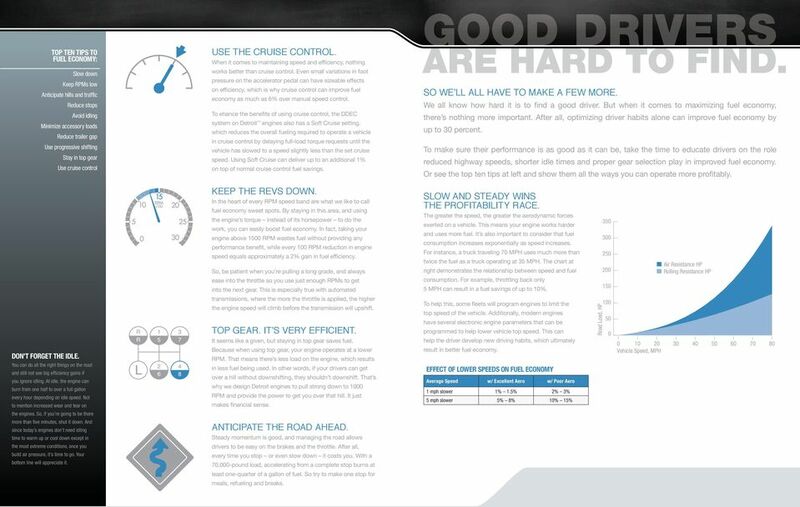 Download "FUEL ECONOMY CREATING OPTIMAL PERFORMANCE"
4 A GREAT ENGINE IS ONLY PART OF GOOD EFFICIENCY. MEET A TRIO OF HIGH PERFORMERS. STATS 12.8L HP lb-ft STATS 14.8L HP lb-ft STATS 15.6L HP lb-ft Advances in powertrain engineering have led to engines that run quieter, cleaner and more efficiently than any that have come before. Best of all, they re doing it without a loss in power over earlier models. 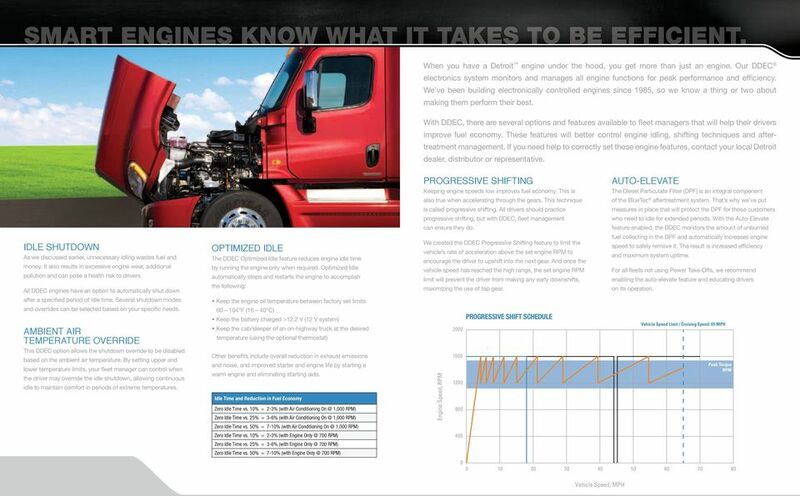 Though selecting a new engine is a great first step, to maximize efficiency, you need to look at your entire powertrain and how it s spec ed for the job you do. GEARING BEST PRACTICES Improvements in fuel economy can be achieved at the expense of performance. Similarly, improvements in performance can be achieved at the expense of fuel economy. 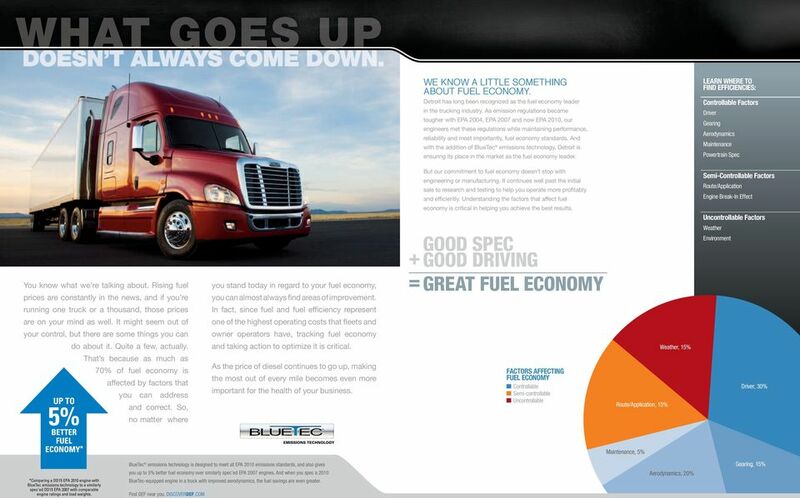 Fleets usually favor better fuel economy while owner operators prefer better performance. The best practice, however, is to gear for balanced performance and achieve the greatest fuel economy while retaining the power to get the job done. 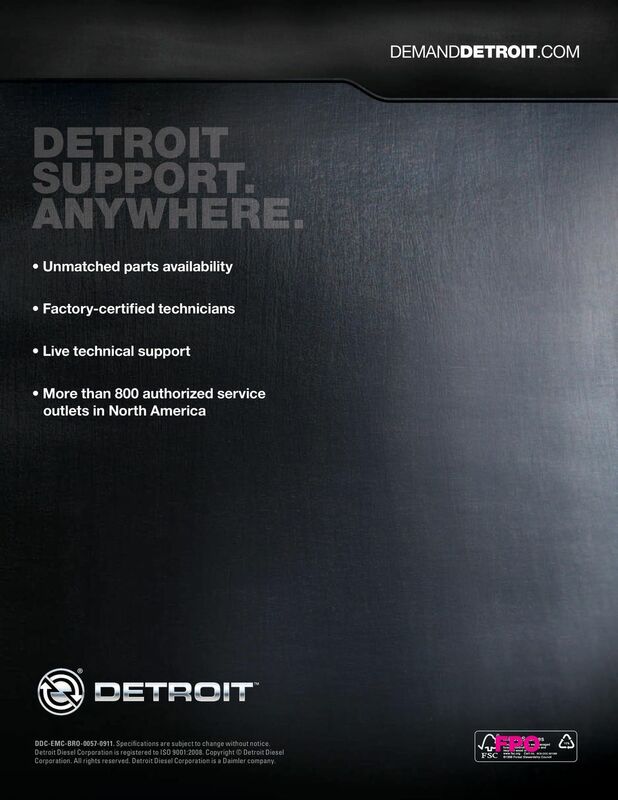 Your Detroit representative can help you choose the right gearing and the right RPM for your application. PLAN UP FRONT FOR PERFORMANCE DOWN THE ROAD. Developing a good spec is the first step in building any new truck. Be sure to gear vehicles correctly and choose an engine rating that s best for your job at hand. An under-powered truck works harder than it has to, and an over-powered truck produces power it doesn t need. Either way, extra fuel is burned. 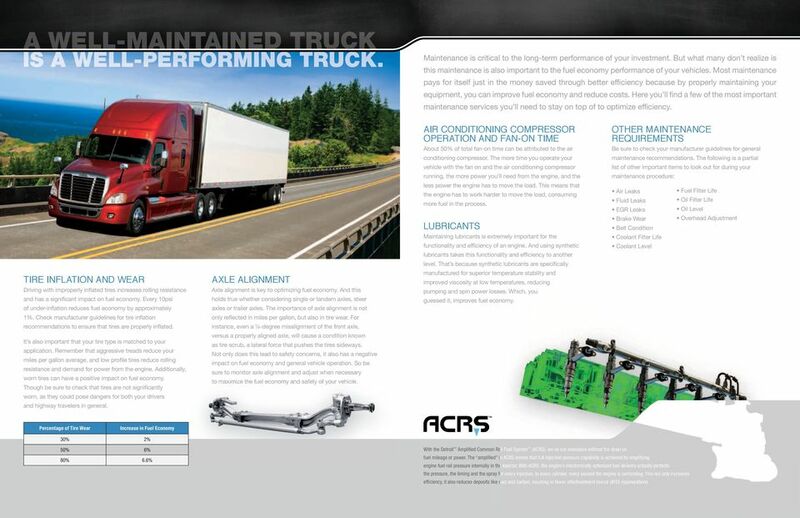 Also ensure that your transmission and axle ratios are optimized for your application. If you re going to be hauling heavy loads up inclines for short distances, your needs are going to be quite different than those of a long haul tractor. Load factors should also be a primary consideration when spec ing to determine the best power ratings and ratios. For help with correctly spec ing your truck, contact your local Detroit dealer, distributor or representative. 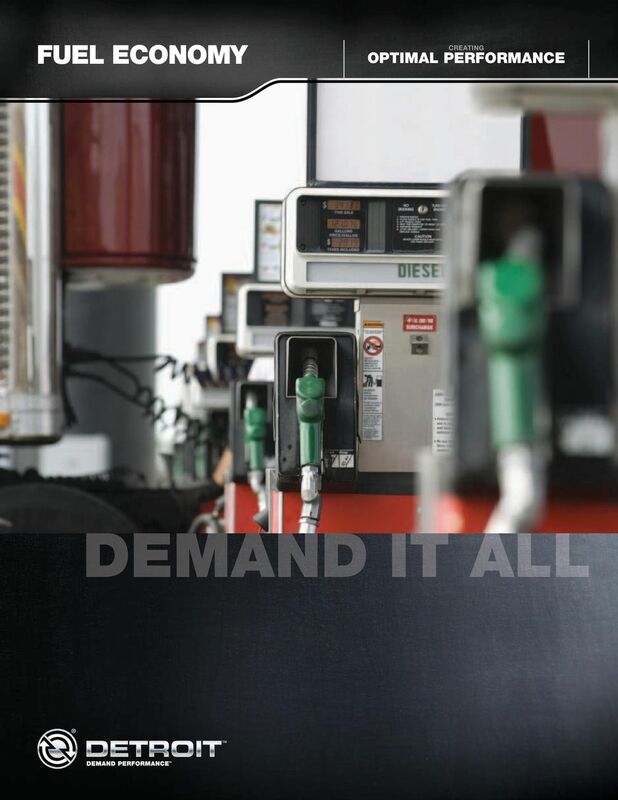 Designed specifically for LTL, vocational or regional trucking needs, driving the Detroit DD13 engine means you no longer have to choose between great fuel economy, serviceability and performance. The DD13 provides the longest service intervals in its class, along with easier serviceability, all in a fuel-efficient design that offers a B-50 life of one million miles and up to 5% better fuel-economy than the 2007 version by integrating groundbreaking technologies, such as the Amplified Common Rail Fuel System (ACRS) and an advanced cooling system. 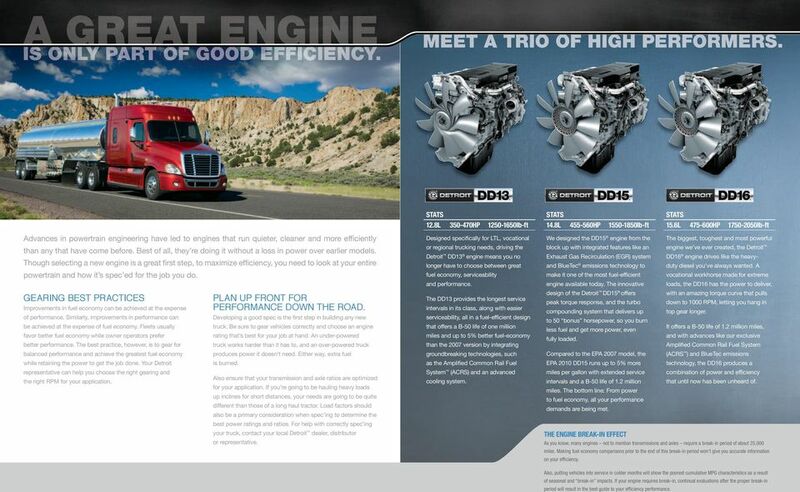 We designed the DD15 engine from the The biggest, toughest and most powerful block up with integrated features like an engine we ve ever created, the Detroit Exhaust Gas Recirculation (EGR) system DD16 engine drives like the heavyduty diesel you ve always wanted. A and BlueTec emissions technology to make it one of the most fuel-efficient vocational workhorse made for extreme engine available today. The innovative loads, the DD16 has the power to deliver, design of the Detroit DD15 offers with an amazing torque curve that pulls peak torque response, and the turbo down to 1000 RPM, letting you hang in compounding system that delivers up top gear longer. to 50 bonus horsepower, so you burn It offers a B-50 life of 1.2 million miles, less fuel and get more power, even and with advances like our exclusive fully loaded. Amplified Common Rail Fuel System Compared to the EPA 2007 model, the (ACRS ) and BlueTec emissions EPA 2010 DD15 runs up to 5% more technology, the DD16 produces a miles per gallon with extended service combination of power and efficiency intervals and a B-50 life of 1.2 million that until now has been unheard of. miles. 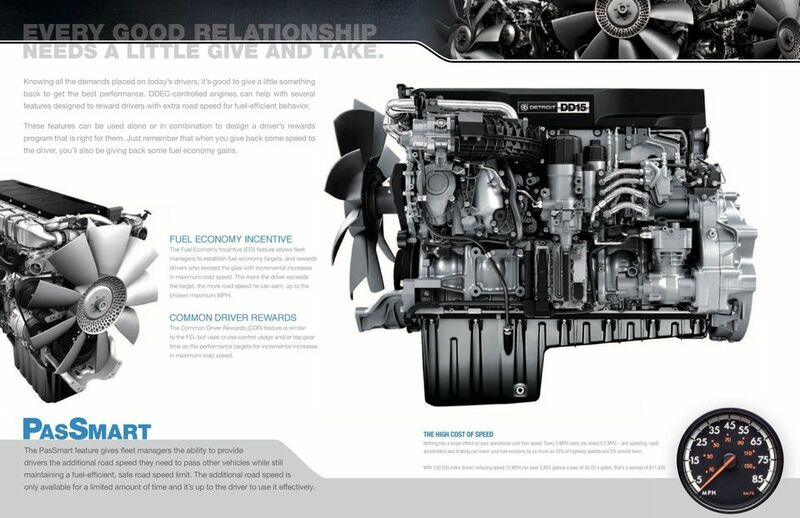 The bottom line: From power to fuel economy, all your performance demands are being met. THE ENGINE BREAK-IN EFFECT As you know, many engines not to mention transmissions and axles require a break-in period of about 25,000 miles. Making fuel economy comparisons prior to the end of this break-in period won t give you accurate information on your effi ciency. Also, putting vehicles into service in colder months will show the poorest cumulative MPG characteristics as a result of seasonal and break-in impacts. If your engine requires break-in, continual evaluations after the proper break-in period will result in the best guide to your effi ciency performance. 6 EVERY GOOD RELATIONSHIP NEEDS A LITTLE GIVE AND TAKE. Knowing all the demands placed on today s drivers, it s good to give a little something back to get the best performance. DDEC-controlled engines can help with several features designed to reward drivers with extra road speed for fuel-efficient behavior. These features can be used alone or in combination to design a driver s rewards program that is right for them. Just remember that when you give back some speed to the driver, you ll also be giving back some fuel economy gains. FUEL ECONOMY INCENTIVE The Fuel Economy Incentive (FEI) feature allows fleet managers to establish fuel economy targets, and rewards drivers who exceed the goal with incremental increases in maximum road speed. The more the driver exceeds the target, the more road speed he can earn, up to the chosen maximum MPH. COMMON DRIVER REWARDS The Common Driver Rewards (CDR) feature is similar to the FEI, but uses cruise control usage and/or top gear time as the performance targets for incremental increases in maximum road speed. PASSMART The PasSmart feature gives fleet managers the ability to provide drivers the additional road speed they need to pass other vehicles while still maintaining a fuel-efficient, safe road speed limit. The additional road speed is only available for a limited amount of time and it s up to the driver to use it effectively. THE HIGH COST OF SPEED Nothing has a larger effect on your operational cost than speed. Every 5 MPH costs you about 0.5 MPG and speeding, rapid acceleration and braking can lower your fuel economy by as much as 33% at highway speeds and 5% around town. With 150,000 miles driven, reducing speed 10 MPH can save 2,857 gallons a year. At $4.00 a gallon, that s a savings of $11,428. 7 THE UNSURPASSED STYLE OF MAXIMUM EFFICIENCY. 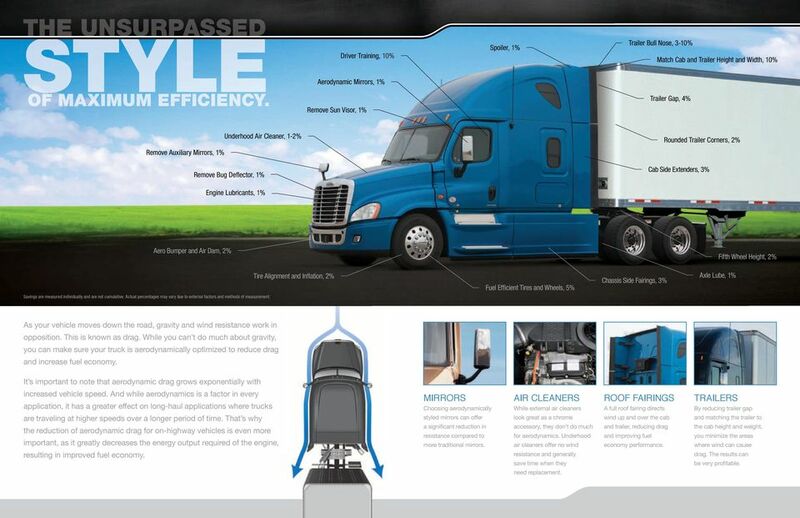 Remove Sun Visor, 1% Driver Training, 10% Aerodynamic Mirrors, 1% Spoiler, 1% Trailer Bull Nose, 3-10% Match Cab and Trailer Height and Width, 10% Trailer Gap, 4% Underhood Air Cleaner, 1-2% Rounded Trailer Corners, 2% Remove Auxiliary Mirrors, 1% Remove Bug Defl ector, 1% Cab Side Extenders, 3% Engine Lubricants, 1% Aero Bumper and Air Dam, 2% Fifth Wheel Height, 2% Tire Alignment and Inflation, 2% Fuel Effi cient Tires and Wheels, 5% Chassis Side Fairings, 3% Axle Lube, 1% Savings are measured individually and are not cumulative. Actual percentages may vary due to external factors and methods of measurement. As your vehicle moves down the road, gravity and wind resistance work in opposition. This is known as drag. While you can t do much about gravity, you can make sure your truck is aerodynamically optimized to reduce drag and increase fuel economy. It s important to note that aerodynamic drag grows exponentially with increased vehicle speed. And while aerodynamics is a factor in every application, it has a greater effect on long-haul applications where trucks are traveling at higher speeds over a longer period of time. That s why the reduction of aerodynamic drag for on-highway vehicles is even more important, as it greatly decreases the energy output required of the engine, resulting in improved fuel economy. MIRRORS Choosing aerodynamically styled mirrors can offer a significant reduction in resistance compared to more traditional mirrors. AIR CLEANERS While external air cleaners look great as a chrome accessory, they don t do much for aerodynamics. Underhood air cleaners offer no wind resistance and generally save time when they need replacement. ROOF FAIRINGS A full roof fairing directs wind up and over the cab and trailer, reducing drag and improving fuel economy performance. TRAILERS By reducing trailer gap and matching the trailer to the cab height and weight, you minimize the areas where wind can cause drag. The results can be very profitable. 8 A WELL-MAINTAINED TRUCK IS A WELL-PERFORMING TRUCK. Maintenance is critical to the long-term performance of your investment. But what many don t realize is this maintenance is also important to the fuel economy performance of your vehicles. Most maintenance pays for itself just in the money saved through better efficiency because by properly maintaining your equipment, you can improve fuel economy and reduce costs. Here you ll find a few of the most important maintenance services you ll need to stay on top of to optimize efficiency. TIRE INFLATION AND WEAR Driving with improperly inflated tires increases rolling resistance and has a significant impact on fuel economy. Every 10psi of under-inflation reduces fuel economy by approximately 1%. Check manufacturer guidelines for tire inflation recommendations to ensure that tires are properly inflated. It s also important that your tire type is matched to your application. Remember that aggressive treads reduce your miles per gallon average, and low profile tires reduce rolling resistance and demand for power from the engine. Additionally, worn tires can have a positive impact on fuel economy. Though be sure to check that tires are not significantly worn, as they could pose dangers for both your drivers and highway travelers in general. AXLE ALIGNMENT Axle alignment is key to optimizing fuel economy. And this holds true whether considering single or tandem axles, steer axles or trailer axles. The importance of axle alignment is not only reflected in miles per gallon, but also in tire wear. For instance, even a ¼-degree misalignment of the front axle, versus a properly aligned axle, will cause a condition known as tire scrub, a lateral force that pushes the tires sideways. Not only does this lead to safety concerns, it also has a negative impact on fuel economy and general vehicle operation. So be sure to monitor axle alignment and adjust when necessary to maximize the fuel economy and safety of your vehicle. AIR CONDITIONING COMPRESSOR OPERATION AND FAN-ON TIME About 50% of total fan-on time can be attributed to the air conditioning compressor. The more time you operate your vehicle with the fan on and the air conditioning compressor running, the more power you ll need from the engine, and the less power the engine has to move the load. This means that the engine has to work harder to move the load, consuming more fuel in the process. LUBRICANTS Maintaining lubricants is extremely important for the functionality and efficiency of an engine. And using synthetic lubricants takes this functionality and efficiency to another level. That s because synthetic lubricants are specifically manufactured for superior temperature stability and improved viscosity at low temperatures, reducing pumping and spin power losses. Which, you guessed it, improves fuel economy. OTHER MAINTENANCE REQUIREMENTS Be sure to check your manufacturer guidelines for general maintenance recommendations. The following is a partial list of other important items to look out for during your maintenance procedure: Air Leaks Fluid Leaks EGR Leaks Brake Wear Belt Condition Coolant Filter Life Coolant Level Fuel Filter Life Oil Filter Life Oil Level Overhead Adjustment Percentage of Tire Wear Increase in Fuel Economy 30% 2% 50% 6% 80% 6.6% With the Detroit Amplifi ed Common Rail Fuel System (ACRS), we ve cut emissions without the drain on fuel mileage or power. The amplifi ed in ACRS means that full injection pressure capability is achieved by amplifying PMS 2915 C63 M7 Y0 K0 engine fuel rail pressure internally in the injector. With ACRS, the engine s electronically optimized fuel delivery actually perfects the pressure, the timing and the spray for every injection, to every cylinder, every second the engine is performing. This not only increases effi ciency, it also reduces deposits like soot and carbon, resulting in fewer aftertreatment device (ATD) regenerations. Das Auto. Fuel-saving tips for your Volkswagen. Heavy vehicle selection guide Introduction This guide is designed to help you, as a heavy vehicle purchaser, choose the right vehicle to improve your business s efficiency, safety and ultimately profitability. Tune Your Fleet. Best Practice Energy Effi ciency & Safety. 1 victoriantransportassociationinc.